Spinach (Spinacia oleracea) is an erect, smooth, annual herb of rapid growth, related to the beet. It is the most important of the potherbs or greens grown in this country. It is a hardy plant, and the foliage for which it is grown develops rapidly. Early in the season numerous large leaves are crowded on the short stem just above the soil surface. In the North it is grown as an early spring and late fall crop but in the south mainly as a winter crop. During the summer the plant produces a flower stalk 2 to 3 feet in height and develops seed. Seed of the Curled Savoy (variety inermis) was planted Apr. 10 in drills 12 inches apart. After the plants were well established, they were thinned to 4 inches distant in the row. Early Development.--At the initial examination, May 23, the plants had 10 to 12 leaves each. About seven of the largest had blades 2 to 4 inches long and 1.5 to 3 inches wide. The transpiring surface averaged 134 square inches, exclusive of the yellowed cotyledons which were still on the plants. Fig. 26.--Six-weeks-old root system of Curled Savoy spinach. Below the 8-inch level the main laterals were only about 1 to 3 inches long and in the harder soil of the second foot much shorter. The rapidly growing root ends were free from branches. Half -grown Plants.--A second examination was made June 17. The tops had a spread of nearly 1 foot and averaged 13 inches in height. About 65 leaves were found on plants of average size. The larger ones near the base had leaf blades 4 by 5.5 inches. Thus the transpiring surface which was now 2.2 square feet, had greatly increased. The underground parts had grown in a corresponding manner. The strong taproot was 15 millimeters in diameter and enlarged throughout the first 6 inches of its course. It reached a depth of 3.5 feet. It bore abundant laterals to within a short distance of its tip. An examination of Fig. 27 shows that the absorbing system had been increased in three ways: by an elongation of branches and greater branching in the soil area formerly occupied (cf. Fig. 26), by a downward extension of many of the larger laterals, and by the elongation or development of numerous branches from the taproot below the first foot. Branching in the surface 8 inches of soil was now quite profuse. Secondary branches commonly varied from 0.5 to 1 inch in length but occasionally branches 2 to 8 inches long occurred. These were clothed with laterals at the same rate as the main branches which was about seven per inch. Short branches of the third order frequently occurred in abundance. Moreover, there were many more laterals on this portion of the taproot than at the earlier examination. Fig. 27.--Spinach on June 17, at the age of 10 weeks. 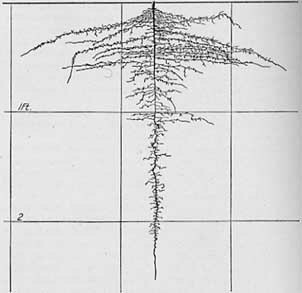 Figure 27 shows that the widely spreading laterals (maximum extent, 14 inches), some of which descended to the 2-foot level or beyond, were also well branched. Branches on the taproot below 8 inches were, with few exceptions, quite horizontal but did not spread widely. Below 1.5 feet they frequently occurred in groups, sometimes being confined to one side of the root for a short distance. Frequently as many as 12 arose from a single inch of taproot. The unbranched condition of the younger roots, as well as the absence of laterals from the main root ends, indicated that growth was proceeding rapidly. Mature Plants.--A final examination was made July 10 on maturity of the plants. They had stems over ½ inch thick and 2 feet high. All the basal leaves and many of the stem leaves were dry. The plants had blossomed and set fruit. The taproot had a diameter of over 1 inch near the soil surface but tapered gradually to 1 millimeter in thickness at the 15-inch level. It reached a depth of 6 feet. In the first 6 inches of its course 40 to 46 laterals took their origin. Nearly half of these were large ones. On the deeper half of the first foot of taproot, however, only 18 to 20 laterals were found and all but one or two of these were relatively small. In fact no large branches occurred below the 10-inch soil level. But to a depth of 2 feet small branches were found in great profusion--as many. as 80 on the second foot of taproot alone. These varied in length from 0.5 to 3 inches. The longest were rebranched with short rootlets. At still greater depths branches arose at the same rate as at the preceding examination, about 8 to 12 per inch. These had increased somewhat in length; most of the rootlets still pursued a horizontal course; and sublaterals were more abundant. The widely spreading laterals which originated in the surface 6 inches of soil now reached depths of 3 to 4 feet. Also some of the larger branches originating at greater depths had extended outward and then turned downward so that the soil around the taproot was more thoroughly occupied. Many of the root ends were decayed. Branches on these main laterals 5 to 10 inches in length were not uncommon. The rate of branching was 6 to 18 laterals per inch and the length varied usually from 0.2 to 3 inches. Branchlets of the third order were abundant. Thus the soil volume delimited at the June examination was much more thoroughly ramified. It has also been extended from a depth of about 2 feet (exclusive of that occupied by the taproot) to about 4 feet. The roots were yellowish in color and rather brittle. Summary.--Spinach has a pronounced taproot which grows rapidly, penetrates deeply, and gives rise to major branches only in the 6 to 10 inches of surface soil. These spread rather horizontally, usually a foot or less, and then, turning downward, penetrate to depths of 3 to 4 feet. Branching on the first foot of the taproot is very profuse; the finer branches with the laterals from the main roots quite fill the soil volume, the upper surface of which is early blocked out. The taproot, below the first foot, is clothed with relatively short but numerous branches. These add considerably to the absorbing surface in the deeper soil. A depth of 6 feet is attained. Other Investigations on Spinach.--Very little study has been given to the root habit of spinach. At Geneva, N. Y., the Prickly or Winter variety was examined on July 28. Allowing for differences in soil structure, etc., it would seem that the method employed of washing away the soil failed in revealing the entire root extent. 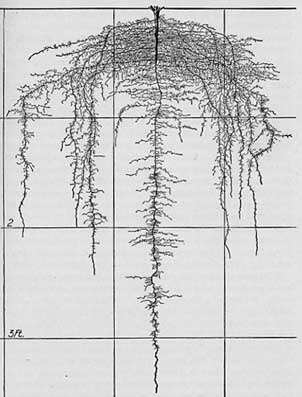 Root Development in Relation to Cultural Practice.--The extensive root system, rapid growth, and great transpiring area are clearly correlated with the best soil combination for the growth of spinach, viz., one that is rich and well drained but constantly moist. Hence, the practice on flat lands of plowing the soil into low, flat beds. The extra drainage afforded also keeps the soil from "heaving" and thus tearing the roots of the winter crop. The plant did not develop a shallow portion to its root system as do many vegetable crops and it is thus less likely to have its roots disturbed by cultivation. The lack of shallow root development may have been due in part, however, to a dry surface soil. In more moist soil many roots might pursue a course nearer the soil surface. The extensive occupation of the surface 2 to 8 inches of soil suggests not only a thorough preparation of this portion of the substratum in regard to humus content and good tilth but also the most effective depth at which to place the fertilizer. The plant must make a quick growth to be crisp and tender and abundant soluble nitrate compounds within reach of the roots promote development of foliage. The usual spacing of the plants, about 6 inches apart in rows 8 to 14 inches distant, results in considerable root overlapping and a complete occupancy of the soil. Root competition is ameliorated to a great extent, however, by well-prepared, very rich soil in which the moisture is conserved by weed eradication and by the preservation of a surface mulch.